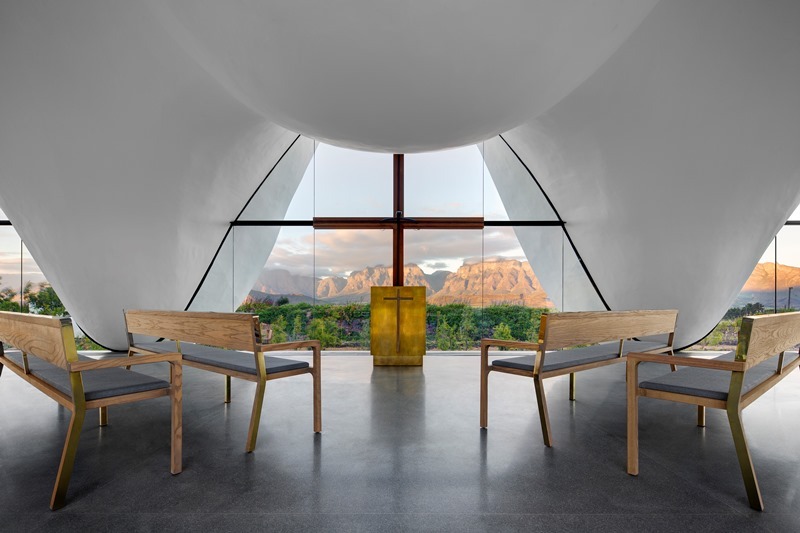 Nestled in the Breede Valley at the foot of the Waaihoek Mountain, the Bosjes farm is home to an architectural masterpiece – Bosjes Chapel. As majestic as the surrounding mountains, the striking white undulating roof amplifies the natural contours of its surroundings. 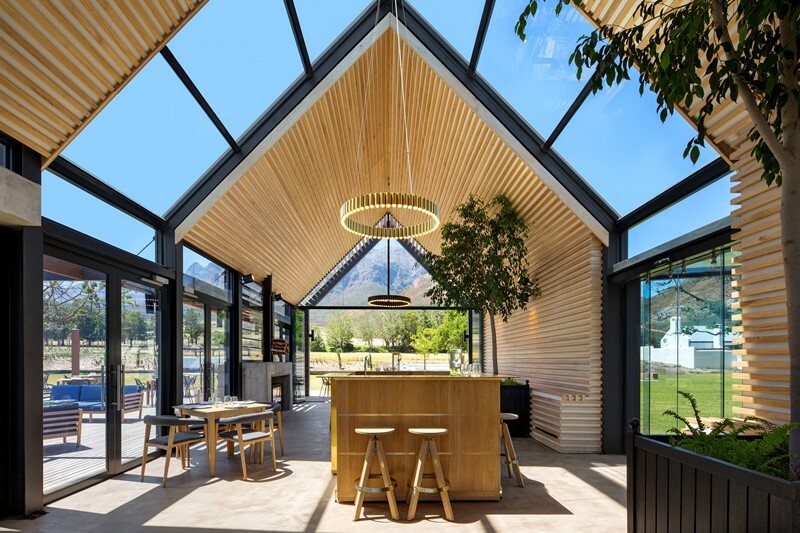 The iconic project was undertaken by UK-based Steyn Studio and local TV3 Architects and Town Planners, and also included the construction of the beautiful Bosjes Kitchen, an extension of the existing Cape Dutch manor house and the conversion of an old barn into guest suites. 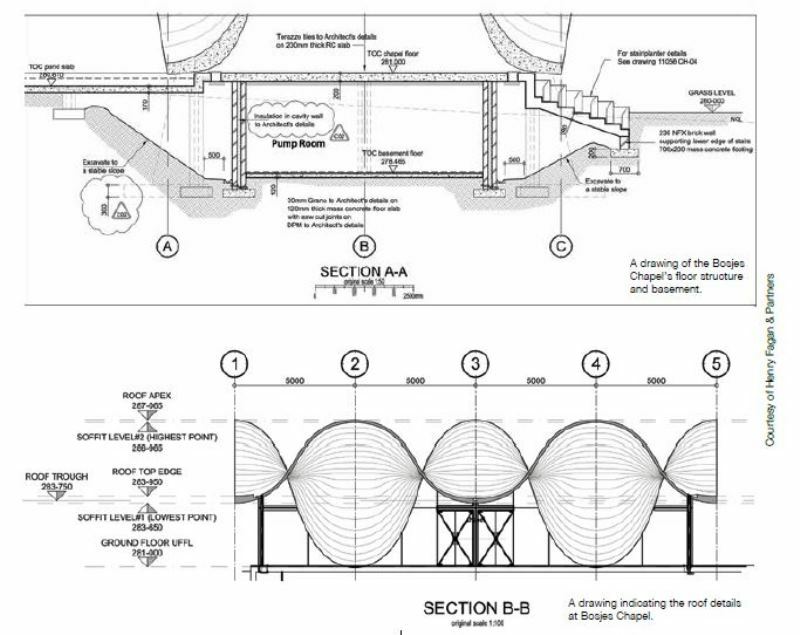 In preparation for the construction of the chapel’s roof, a 1:2 scale sample section of the roof was constructed for the team to workshop all the relevant details and finishes. The whole structure was divided into eight sections, of which four were identical quarters mirrored on the centre line. And apart from a 3-D CAD model, TV3 also produced 130 drawing sections through the chapel roof. Psalm 36:7: “How precious is your gracious love, God! 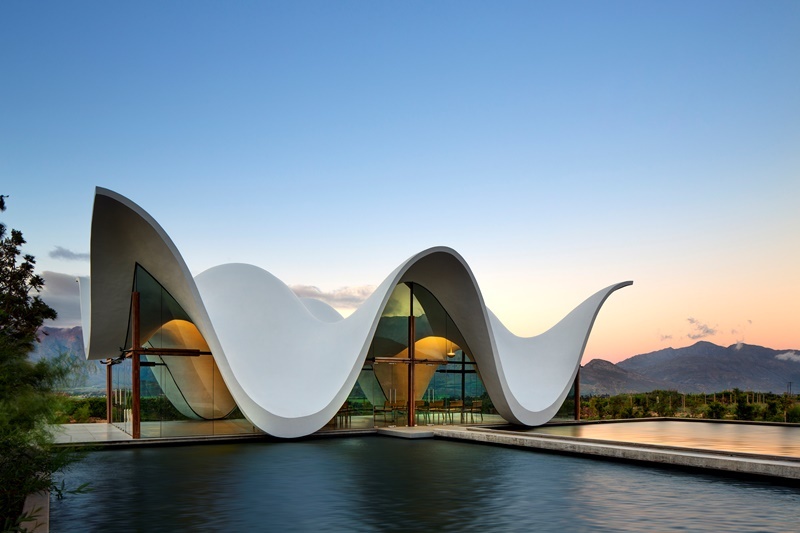 The children of men take refuge in the shadow of your wings.” This Biblical scripture was architecturally interpreted to, in part, inspire the floating, curvy profile of the chapel. The intricate curves were shaped using props and 584 purpose-made timber trusses on which 3,13km of timber battens were installed. These were clad with timber plywood that was soaked in water for 24 hours to enable it to follow the curves. The shotcrete was reinforced with 8 175kg of steel/rebar, while the smooth exterior finish was created with Sika Monotop, which was painted. Although it appears that the chapel roof lightly touches the ground at four points, the roof is actually supported by four hidden reinforced concrete buttresses, each with a vertical load of close to 50 ton. Connecting the glazed walls to the curved concrete roof turned out to be a major challenge, since the glass never meets the concrete at the same level or angle. Connecting the glazed walls to the curved concrete roof turned out to be a major challenge since the glass never meets the concrete at the same level or angle. For the glazed walls, 16,76mm toughened laminated safety glass was used. To mitigate the thermal movement in the structure, the roof and floor structures are completely separated by a service channel around the perimeter of the floor at the point where the glass connects with the floor. This service channel also accommodates the air-conditioning ducts and louvres and most of the electrical reticulation. Below the floor is a full basement hidden on the one side by the large reflection pond and on the other three sides by landscaped platforms. The basement accommodates the HVAC system, electrical boards, pumps and filters for the water features and store rooms for the chapel benches. When it rains, the centre of the roof is drained by means of a submersible pump with sump and pipe via a pipe that was cast into the concrete with the outlet hidden under the lowest part of the roof, where it meets the reflection pond. The interior of Bosjes Kitchen features ash timber slatted panelling, with Isover Ecosound infill strips between the timber slats to enhance the acoustic treatment of the space. Bosjes Kitchen’s external wall make-up consists of Jarrah wood, for the silver-grey appearance and its superior structural integrity, as well as dry-pack stone cladding with glass and steel connections in-between. Lucie Demoyencourt and Michael Chandler designed and created this unique piece of art. 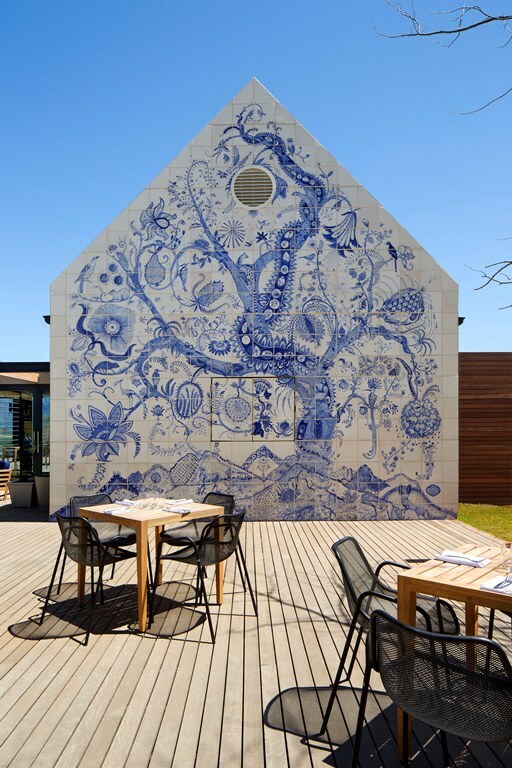 The blue and white ceramic mural was hand-painted with cobalt oxides on bisque-fired ceramic tiles. Once the painting of the image was complete, the tiles were fired one last time with a transparent glaze. A drawing indicating the roof details at Bosjes Chapel. To accommodate guests at the spectacular venue, the existing Cape Dutch manor house was extended and old barn buildings were converted into guest suites. “We restored most of the significant heritage buildings and structures that date back to around 1790, and demolished the insignificant ones that detract from the historic linear ‘werf’ layout,” states Edwin Swanepoel, director at TV3. “Both the manor house (main building) and the guest suites (barn buildings) had existing attics and we decided to keep them. “We also managed to retain the old thick clay walls and with the help of an interior designer, Liam Mooney, it became a primary feature in the new guest rooms. However, we had to restore and patch some parts of the disintegrating wall and could not find a clear sealer that was breathable enough. Finally, we painted it with a diluted paint suitable for old clay walls and the end-result was absolutely magnificent. “Part of an old concrete wall, which was part of the old wine cellar, was also retained in the new guest lounge and we decided to keep it unpainted. It now brings warmth and colour to the guest lounge and kitchen,” Swanepoel explains. The manor house roof covering was replaced with 0,5mm Brownbuilt galvanised corrugated iron sheeting, and a combination of Sisalation 405 and 50mm Isopine board was added to improve the thermal performance of the roof. “A completely new roof was put over the guest suites with a higher ceiling to create that ‘heritage volume’ throughout. We reused the old Nordic Pine beams from the previous attic trusses as feature beams in the bedrooms,” says Swanepoel. The same roof covering was used as on the manor house roof, but with 100mm Aerolite insulation on top of the ITM Spruce tongue and groove ceiling. Skylights, from Tony Sandell, were introduced on the mountain side of the manor house extension and guest suites to enhance natural light into deep spaces and to create beautiful mountain views from the habitable attic spaces. A pitched roof glass structure subtly connects the old manor house and new addition. Situated to the northwest of the manor house, and clipping on to the main building to form an H-layout, Bosjes Kitchen was constructed out of a combination of stone, concrete, glass and wood, which aims to connect the building with the surrounding landscape. It is an open-ended extruded gable profile, with glass panels in the structure that allow expansive views of the valley and mountains. According to Swanepoel, the external wall make-up was quite a challenge in section, plan and elevation. “On the outside, we elected to use Jarrah wood to get a silver-grey appearance and also for its superior structural integrity. We further installed dry-pack stone cladding with glass and steel connections in-between. “On the inside we used ash timber slatted panelling for most of the wall cladding and ceilings, with Isover Ecosound infill strips between the timber slats to enhance the acoustic treatment of the space,” he explains. 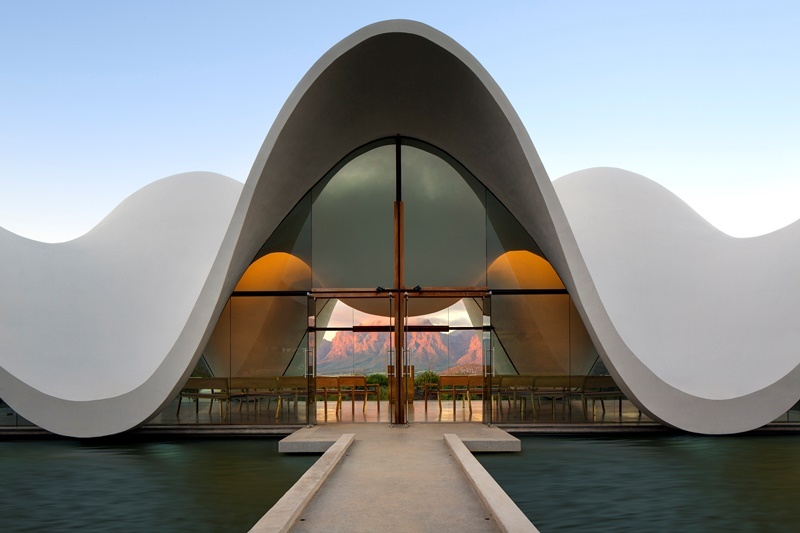 The world-class Bosjes chapel, boutique guest house and restaurant opened its doors mid-March, and is an iconic destination lauded both locally and internationally. Full thanks and acknowledgment are given to TV3 Architects and Town Planners and Steyn Studio for the information given to write this article. Principal agent and lead architect: TV3 Architects and Town Planners (Edwin Swanepoel). 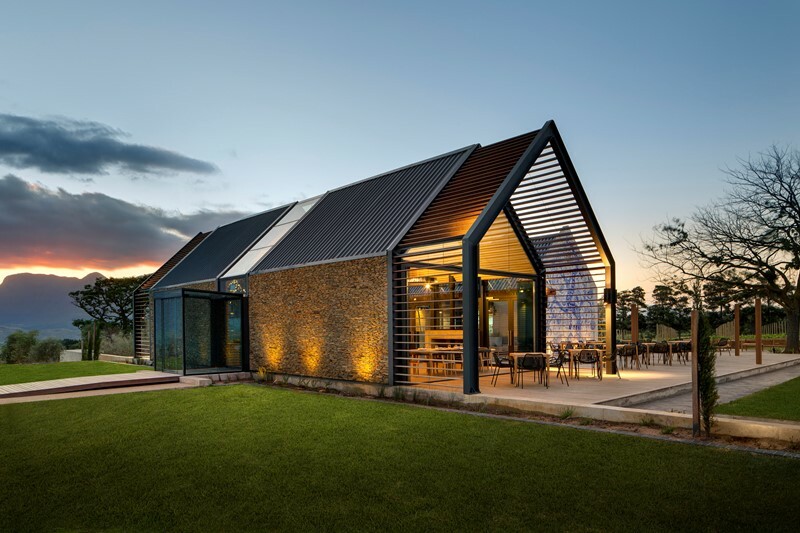 Design architect (masterplan, chapel and restaurant): Steyn Studio (Coetzee Steyn). Design architect (manor house and guest suites): TV3 Architects and Town Planners (Hendro Hugo). Landscape architect: CNdV Landscape Architects. Interior designer and furniture design: Liam Mooney Studio. Structural and civil engineers: Henry Fagan & Partners. Electrical and mechanical engineers: Solution Station. Quantity surveyor: De Leeuw Stellenbosch. Heritage consultants: Elzet Albertyn, assisted by Graham Jacobs and Lize Malan. Main contractor: Longworth & Faul. Caption Main Image: Although it appears that the chapel roof lightly touches the ground at four points, it is actually supported by four hidden reinforced concrete buttresses, each with a vertical load of close to 50 ton.